Onlangs presenteerden we hier de Startup Infrastructure Diagram Nederland. In een reeks artikelen zoomen we in op de verschillende categorieën. Vandaag: Capital. Heb je het diagram nog niet gezien? Klik dan hier. We gaan samen met een spelers uit het veld dieper in op een aantal ontwikkelingen in het veld. 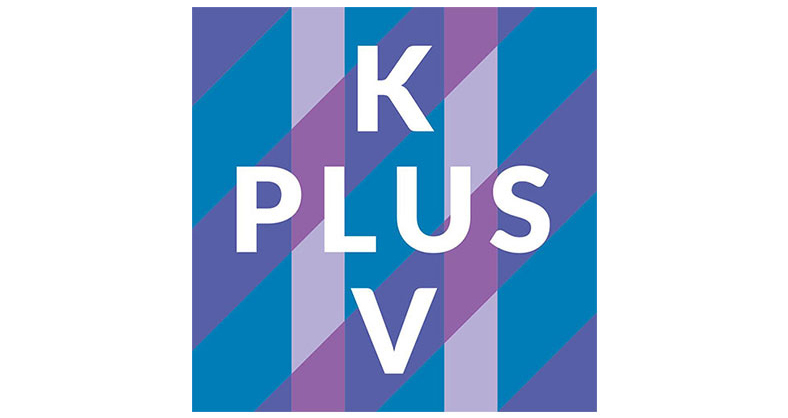 “Er is in de Nederlandse markt ruim voldoende professioneel kapitaal aanwezig” – Johan van Mil, Peak Capital. Door deze groei is er ook meer ruimte voor diversificatie. 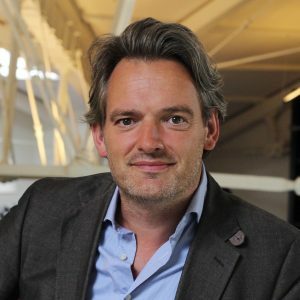 “Fondsen kiezen steeds vaker voor een bepaalde fase (early stage, later stage), als ook bepaalde sectoren (biotech, software, health)”, ziet Johan. Daarnaast onderscheiden steeds meer fondsen zich van elkaar door een andere aanpak zoals Accelerators die zich kenmerken door een kort maar intensieve periode tot fondsen die alleen kapitaal investeren en verder niet betrokken zijn. En alles daartussen. Recently we presented the Startup Infrastructure Diagram the Netherlands. In a series of articles we will have a closer look at each of the categories. Today: Capital. Missed the diagram? Click here to download it. Access to capital remains one of the most important features of successful entrepreneurship ecosystem. Entrepreneurs simply need cash to start and to grow. At first glance this doesn’t seem to be a problem in the Netherlands: in 2017, a total amount of €646 million was invested in Dutch startups, according to calculations by Golden Egg Check¹. 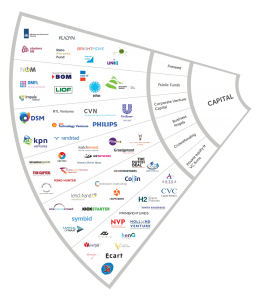 The Startup Infrastructure Diagram (SID) the Netherlands shows that capital is provided by a large amount of stakeholders in various categories. For startups, this means they can choose the type of investment that suits their strategy and the stage they’re in. Together with experts from the ecosystem we will have a closer look at some of the developments taking place that are shaping the capital landscape. “Low interest reates, interesting government incentive schemes (such as the Seed Capital scheme), and high success rates of startups all contribute to a market where ample professional capital is available”, explains Johan van Mil, Co-Founder & Managing Partner at Peak Capital. “This translates to a strongly developed landscape of Venture Capital funds for growth companies, following the earlier rise of Private Equity for mature firms”. This growth leads to more room for diversification. “Funds are choosing more often to focus on a certain stage (early stage, later stage), or a specific sector (biotech, software, health)”, says Johan. Funds are also trying to distinguish themselves through their approach. From accelerators, who offer a short but intensive programme, to funds who merely invest capital and are not involved in any other way. And everything in between. Entrepreneurs increasingly resort to alternative sources of financing to attract growth capital. “Since the financial crisis we see that a lot of capital that was traditionally financed by banks, is no longer available. 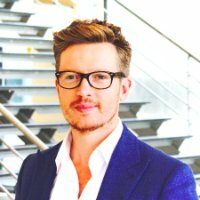 Whereas entrepreneurs used to simply ‘go to the bank’ to get start- or growth capital, we now see that these entrepreneurs are now reaching out to alternative sources of finance (sometimes because they don’t have a choice)”, explains Robin Slakhorst, founder of crowdfunding platform Symbid. “Alternative financing often is way more specialist to a specific aspect of a company’s ‘balance sheet’, which means that entrepreneurs increasingly have to consider carefully which type of financing suits the stage of their company”. Entrepreneurs are becoming more aware of this. Adding to this, we see that increasingly entrepreneurs are not merely thinking about the cash, but also about other advantages that various types of financing can offer. Start-ups seeking capital through crowdfunding for example, don’t only get access to capital, but also to an active community and the opportunity to test their product in the market. Platforms such as Symbid are an efficient way match supply and demand. Slakhorst explains that “it is so efficient that in the Netherlands, more than 10% of all angel investments take place on crowdfunding platforms that specialise in risk capital, such as Symbid. Individual and semi-professional investors join these platforms to invest in high-risk, innovative companies. They want to be part of the entrepreneurial journey, and if successful also gain a financial benefit”. The trends being outlined offer a positive outlook. Nevertheless there is still room for growth and improvement. “For companies in the idea-stage, particularly those working with new technologies like AI, there might be room for new players in the ecosystem”, says Johan. We also have to look critically at the role of the government. “In the Netherlands we see countless government initiatives aimed at stimulating entrepreneurship and investment, but often these initiatives only help to limit risks for existing investors and do not necessarily lead to more investments”, Robin explains. In the United Kingdom for instance, we see special tax incentives through which the state co-invests indirectly, and at the same time decreases the risk for investors. Availability of capital for start-ups is of course key. But we also have to be careful to not put too much emphasis on the presence of mere capital. Instead we should also take into account other key factors such as the existence of entrepreneurial talent and sufficient support opportunities for entrepreneurs. In the next week we will look closer at these and other factors. In the meantime, have a look at the Startup Infrastructure Diagram to see the initiatives that strengthen the Dutch ecosystem when it comes to capital. Want to suggest a change? Click here. Suggestions or input? Let us know. Leave a comment or e-mail denise@halbekoenraads.nl. Techzine (2016, 30 December). Nederlandse startups haalden 252 miljoen euro op in 2016.